Help keep the Township beautiful, participate in Adopt-a-Program. Individuals, groups, businesses, or schools can choose a street, park, trail, or creek to adopt. Commit to cleaning the litter in an area for one year and the Township will provide cleaning supplies, safety information, garbage removal, and a sign to recognize your efforts. The Adoption Map shows what streets, parks, trails and creeks are available for adoption. Please note, areas highlighted in blue are currently adopted. 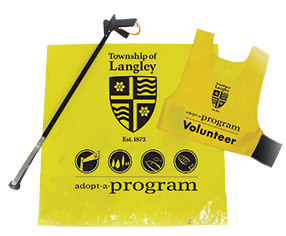 Contact the Adopt-a-Program Coordinator with your selection at 604-532-7300 or adopt@tol.ca. Not ready to commit? Try a one-time cleanup to see if it’s right for you. Hosting a cleanup is a great team-building activity for business, schools, and other community groups looking to give back to their community! Please complete an online Cleanup Report after each cleanup (or at least once a month). Cleanup Reports let us know how much and what type of material is being collected, which helps to improve waste management programs in the Township. The reports also provide a means for you to request garbage pick up, report anything unusual, and let us know you are still active in the program. Your safety is the number one priority. Learn more by reading our Guide to Safe Litter Cleanup before your first cleanup. Remember, do not pick up any hazardous, sharp, or heavy materials. Report the location of the materials for pick up through the online Cleanup Report. A map was created to help Adopt-a-Program volunteers see when boulevards and ditches along their adopted streets are scheduled for mowing or brushwacking. This can help volunteers plan their cleanups before mowing or brushwacking occurs to avoid litter being cut into smaller pieces. Active mowing areas are usually completed within 3-5 business days while active brushwacking areas are usually completed within 20-30 days. Read the most recent copy of the Adopt-a-Program newsletter . The newsletter is dedicated to increasing volunteer awareness about the Adopt-a-Program as well as waste management initiatives in the Township. Thank you to the families and individuals, schools, churches, service clubs, special interest groups, and local businesses who have been/are a part of the Adopt-a-Program. Your efforts in keeping our streets, parks, trails, and creeks clean makes a big difference in our community!